Murder Of Our Soul By Mannix Flynn (Dublin), originally uploaded by infomatique. 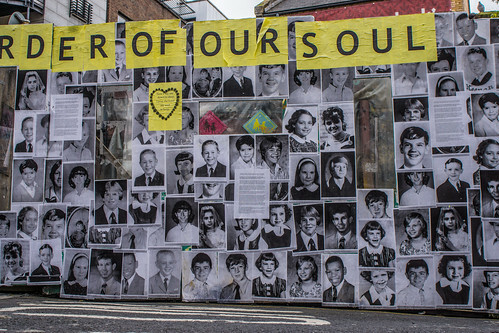 This exhibit created by Mannix Flynn can be found in Temple Bar in Dublin (I have located it on the may). It consists of a wall plastered with the images of children who have suffered abuse at the hands of priests and members of the clergy. "Pressure grows on Cardinal Séan Brady to resign: Education Minister Ruairi Quinn has said he believes that Cardinal Seán Brady should consider his position, following allegations in a BBC documentary about a church inquiry into child abuse in the 1970s."